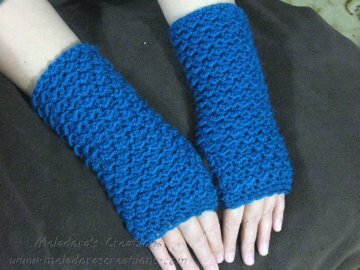 This Free Crochet pattern teaches you how to make some crocheted fingerless gloves using the Moss Stitch. HOOK: 5 mm / H hook and tapestry needle. 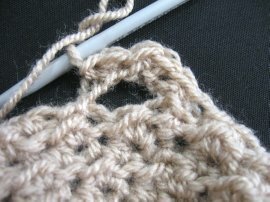 The Moss stitch consists of 2 different stitches. HDC and sl st. If you wish to adjust the size of this glove, the multiples are 2. * HDC in beginning st, sl st into next * repeat sl st into beginning ch to form a ring. Ch 1 and turn your work. You will be turning your work at the end of every round. * HDC in beginning st, sl st into next * repeat sl st into beginning ch to form a ring. Ch 1 and turn your work. Make sure you are not going into this loop that’s in front of the stitch. 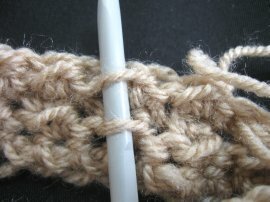 But use the actual stitch, going under both loops. Now from here on out you will be working the rounds as follows. Start with a HDC in the beginning stitch, then sl, this is your first Moss stitch, continue this for the next 6 stitches. 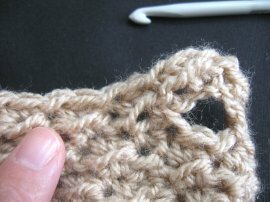 Then turn your work around to check to see if the loop part of the moss stitch are straight or diagonal as picture shows you below. See how the loops line up? This is where you can decide how you want your stitch to look. I prefer mine diagonal. So I will look at the back of my stitches to see if they are going the correct way. If they are then continue pattern as normal with your HDC , sl st. But if they aren’t then rip out to the beginning, and start with a sl st in the first stitch instead of a HDC, then continue as normal. You will have to keep checking every round to make sure the stitches are going the way you want them to. At the end of every round you want to sl st in the begging st and ch 1 and turn your work. You want to continue to repeat round 4 until your gloves reaches, 17 ½ cms or 7 inches, or the desired length you want. Make them longer if you like. Once your done, lets make the thumb hole. ch 6, skip 2 stitches and sl st in the 3rd. Sl st into the next stitch as well, then * HDC, sl st * repeat your moss stitch, making sure your stitches are diagonal from the back. When you get back up to the ch 6, keep working your pattern over the ch 6, sl st in the beginning st and ch 1 and turn. 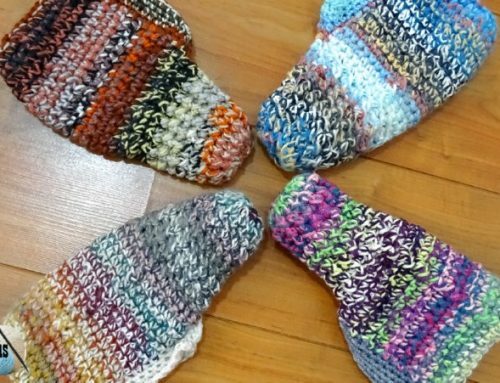 Now working over the thumb sts again, start with a HDC, then sl st, continue until you reach the main part of the glove and do about 6 sts in life you did before, then check to make sure your pattern is stitch running correctly from the back. You won’t be able to tell if your pattern is running correctly on the thumb part yet, so this is why you have to work your pattern until your about 6 stitches into the main part of the glove before you check. Continue on as normal, sl st in beginning st, ch 1 and turn your work. 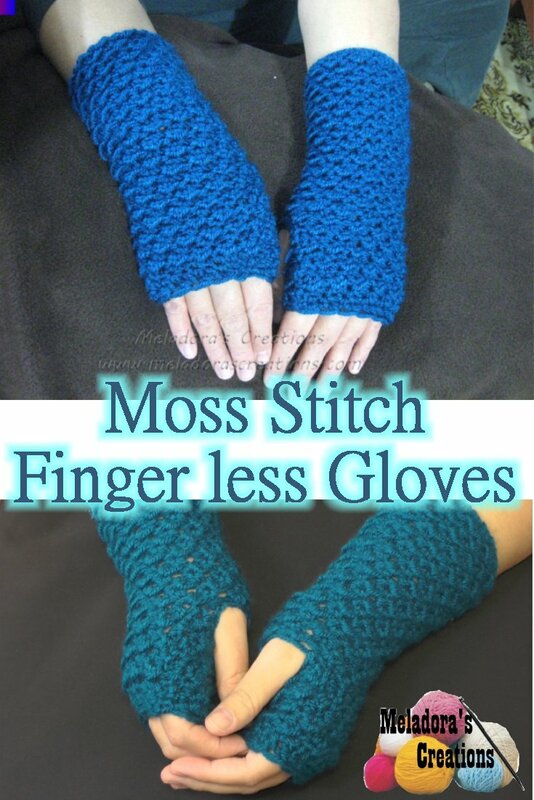 Now you can continue on as normal with your moss stitch. Working the rounds like you did Round 4 of the main part of glove. You want to do this for 6 total rounds. You have already done 2 rounds above the thumb, so you need to do 4 more rounds. If you want to do more rounds than 6, then go ahead. Until you have it as far up on your fingers that you like. If you are a fan of my work, please help me to improve it by becoming a patron. Read more about it here and find out how you can help. 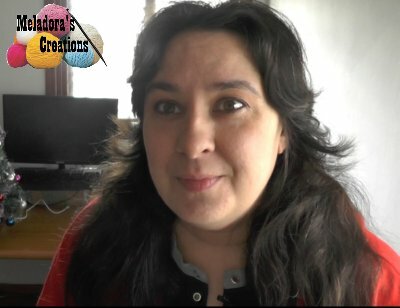 Hi I'm Candy from Meladora's Creations and I design crochet patterns and film them for my YouTube channel. I want to start by saying, I am by no means a professional teacher. I figure things out as I go along and I love playing with yarn! 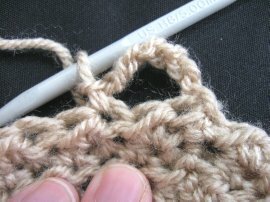 This is how I have discovered new crochet stitches. I am a mother of two and I live in Israel presently, but I was born and raised in Oklahoma. I met a man on an online game and became friends and through time we fell in love and I came out here to Israel to be together. 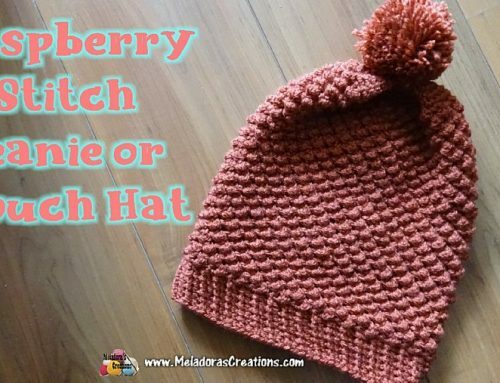 From lack of knowing how to speak Hebrew, I had to find a way to help take care of our two kids, so after sharing my crochet projects online and being asked to do a tutorial on one of them, I finally broke down and tried it. Click on the "About Me" on the top of the page to read a longer version of my story. Welcome to my channel! My name is Candy and I'm a wife and mother of two. 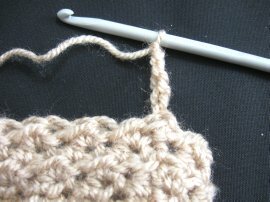 I've been crocheting since I was 5 and crochet has always been a passion of mine. I grew up in Oklahoma City but now currently live in Israel. Crazy story how I ended up out here, if you'd like to know more about me you can click on the "About me" section at the top of the site. If you like my page and visit often maybe you would consider being a supporter of my page by becoming a Patron? My Patrons have already helped me to improve the running of my site twice and also bought my HD camera I use to film my videos. Thank you all so much for helping me live my dream! 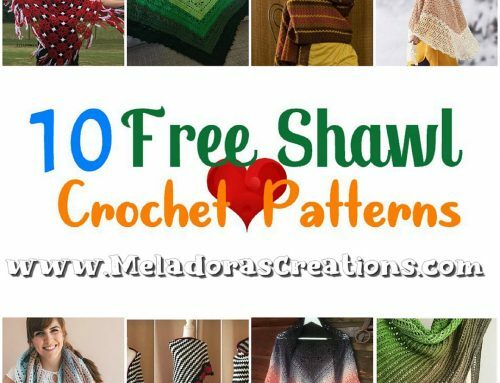 My Elegant Afghan made the list! Happy New year! 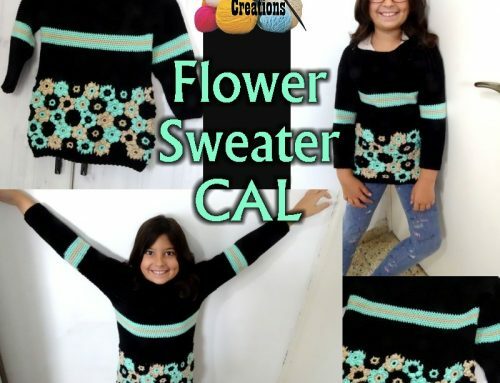 You can find now find my patterns in PDF for a small fee and help my channel at the same time. Be sure to subscribe to my YouTube channel to view all my video tutorial lessons.